Building on the Dodge Journey’s best sales year ever in 2013, the Dodge brand is introducing a new Journey model – the 2014 Dodge Journey Crossroad – at the 2014 Chicago Auto Show. The new Journey Crossroad features distinctive new front and rear fascias, Platinum Chrome side sills and unique 19-inch Hyper Black aluminum wheels, giving the three-row, seven-passenger crossover a rugged, capable look. The interior is loaded with premium finishes and features, including the 8.4-inch Uconnect touchscreen, new leather seat design and Liquid Graphite appliques. 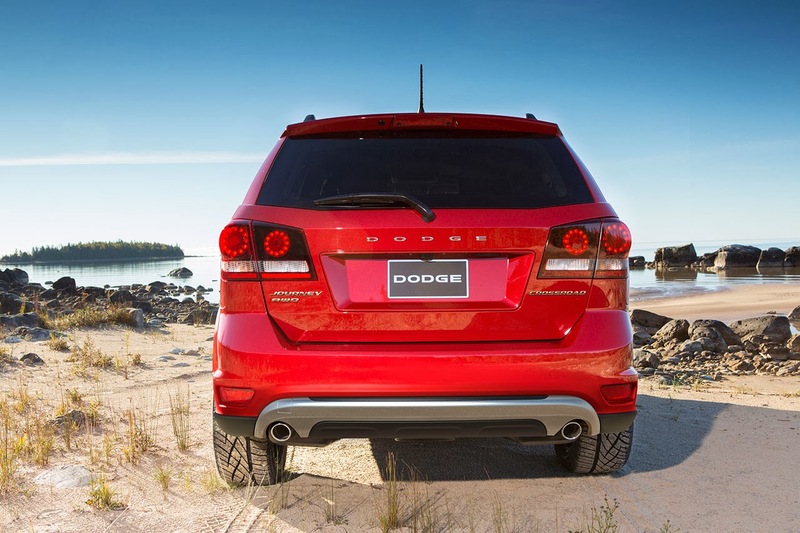 The new 2014 Dodge Journey Crossroad is positioned between the SXT and Limited models in the Journey lineup. Journey Crossroad will start arriving in Dodge dealerships this spring with a starting U. S. Manufacturer’s Suggested Retail Price (MSRP) of $24,995 (excluding $995 destination). Dodge designers added several special exterior design cues to the Journey Crossroad that give it a distinct look in the lineup, including a new front fascia with a Platinum Chrome accent and Gloss Black grille and fog lamp surrounds, Platinum Chrome roof rails and unique extended side sills, black headlamp bezels, Gloss Black tail lamp bezels and a new lower rear fascia finished in Platinum Chrome and a “Crossroad” badge on the tailgate. Journey Crossroad also features unique 19-inch Hyper Black five-spoke aluminum wheels. Exterior colors for the 2014 Dodge Journey Crossroad include Pitch Black, Bright Silver Metallic, White, Copperhead Pearl, Fathom Blue Pearl, Granite Crystal Metallic, Pearl White Tri-Coat and Redline Red 2-coat Pearl. On the inside, the Journey Crossroad adds many unique interior touches, including new standard black leather seating with sport mesh inserts with Light Slate Grey accent stitching. Light Slate Grey accent stitching on the center armrest and door panels, and a leather-wrapped steering wheel and shift knob, are standard equipment. A new Liquid Graphite finish is applied on the instrument panel, gauge cluster, center console, door pulls and steering wheel trim. The Dodge Journey Crossroad also comes standard with the class-exclusive 8.4-inch Uconnect touchscreen, power front seat and a front passenger fold-flat seat with hidden storage bin under the seat cushion. 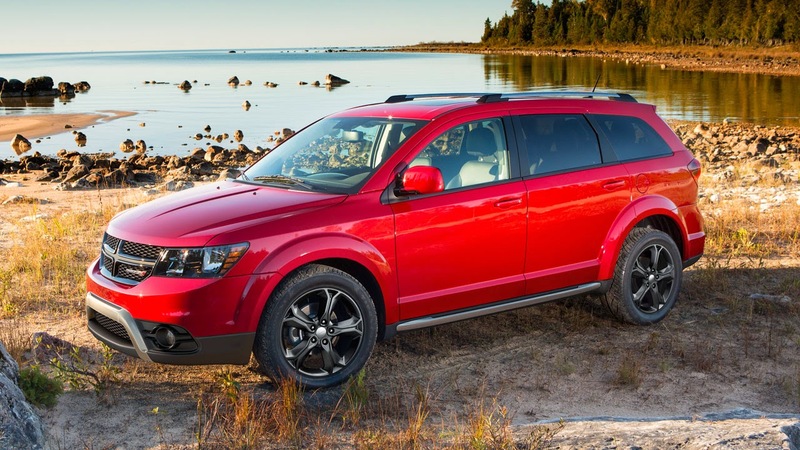 The 2014 Dodge Journey Crossroad offers levels of utility and refinement not typically found in the crossover market. Standard features such as power heated and foldaway mirrors, seven air bags, illuminated cup holders, Keyless Enter ‘n Go with push-button start and steering-wheel-mounted audio and cruise controls. Second- and third-row seats fold flat to create 67.6 cu. ft. of cargo space. Second-row seats recline and have available class-exclusive integrated child booster seats. There are also innovative removable storage bins in the floor ahead of the second-row seats that can hold everything from muddy clothes to soda cans, to concealing valuables like a camera, laptop or purse. With front passenger, second- and third-row fold-flat seats, second-row in-floor storage, and front passenger in-seat storage, Dodge Journey has best-in-class storage. The Journey Crossroad is powered by a standard 2.4-liter 16-valve DOHC four-cylinder engine that produces 173 horsepower and 166 lb.-ft. of torque, linked to a four-speed automatic transmission. This four-cylinder engine delivers 26 miles per gallon (mpg) on the highway. The award-winning available 3.6-liter Pentastar V-6 engine on the 2014 Dodge Journey Crossroad produces a best-in-class 283 horsepower and 260 lb.-ft. of torque and is mated to a smooth-shifting six-speed automatic transmission. This Pentastar V-6 engine was recognized as a Ward’s “10 Best Engines” for 2012 and 2013. In addition to excellent power, it delivers up to 25 mpg on the highway. Both the standard 2.4-liter four-cylinder engine and available 3.6-liter Pentastar V-6 powertrain deliver more than 500 miles of highway driving range. With a 5-year/100,000-mile limited powertrain warranty, owners can rest assured knowing their powerful and efficient Journey is well covered. Backing up the 2014 Dodge Journey Crossroad’s rugged look is its available all-wheel-drive system, perfect for drivers who want extra grip for a more performance feel, or who live in the Snow Belt or rainy parts of the country and appreciate the extra traction Journey’s all-wheel drive system provides. Journey Crossroad’s all-wheel-drive system works on demand, driving only the front wheels to maximize fuel efficiency until power to the rear wheels is needed. All-wheel drive also is activated on dry pavement between speeds of 25 and 65 mph to enhance handling during performance driving. This system provides added traction on snow, ice and other low-traction surfaces without having to be switched on and off. When traveling faster than 25 mph, Dodge Journey’s all-wheel-drive system sends torque to the rear wheels when cornering with the throttle open to make the car turn more easily, which makes the handling more neutral. This is more readily accomplished with Journey’s electronically controlled coupling (ECC) than with viscous-coupling or gerotor systems that require some degree of front-to-rear slip before torque is transferred to the rear wheels. At speeds greater than 53 mph, the control strategy provides minimal torque to the rear wheels under normal driving conditions to provide better fuel economy. Dodge Journey features standard electronic stability control (ESC) and all-speed traction control, which help keep the crossover on path in a variety of road surface and weather conditions. Journey’s available all-wheel-drive electronic control module works with the ESC and traction control systems, allowing the ESC system to use the ECC to help gain control of the vehicle, reducing the amount of torque that the ECC transmits to the rear wheels. 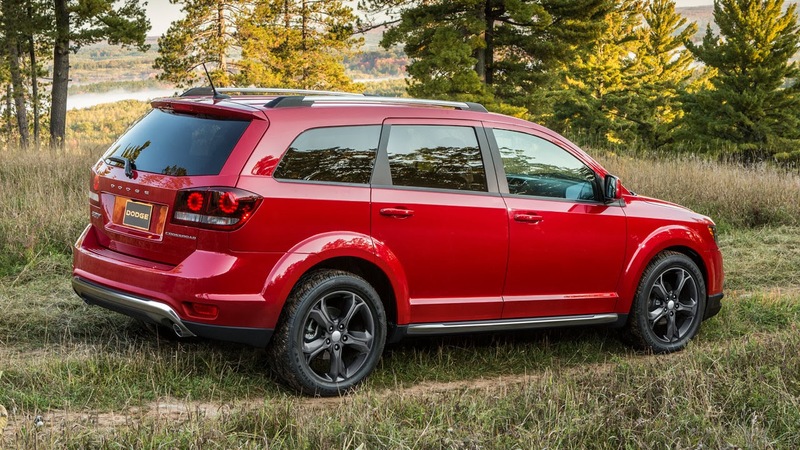 Four-wheel anti-lock brakes and electronic roll mitigation also are standard on all 2014 Dodge Journey models. Dodge Journey is loaded with an abundance of more than 50 safety and security features, including standard advanced multistage front passenger air bags, active head restraints, electronic stability control with all-speed traction control, electronic roll mitigation and Brake Assist, driver-side knee blocker air bag, side-curtain air bags covering all three rows, front seat-mounted side air bags, four-wheel anti-lock disc brakes, LATCH child seat anchor system and trailer-sway control.